Sep 09, 2018 - 12:00 p.m. to 8:00 p.m. 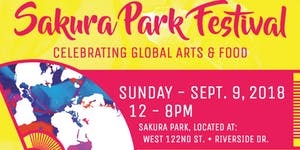 The Sakura Park Festival, sponsored by the Columbia University School of Professional Studies, the Morningside Area Alliance, and International House, celebrates global arts, food, and community in Harlem on September 9 from 12 p.m.–8 p.m. Students and neighbors of every age will experience global dance, live music from Brooklyn to Bali, games, and hands-on activities lead by renowned artisans. Neighborhood restaurants and select purveyors offer dining options for every palate and budget all day long. We hope to spend the day with you—playing, dining, and learning about ways to get involved in the community! RSVP to stay up-to-date on performers and to register for dance and games sessions. Groups are welcome! Stay up-to-date on Twtitter via @sakuraparkfest and #sakuraparkfest. The School of Professional Studies at Columbia University spans the continuum from high school and pre-college students through lifelong learners with innovative offerings at the highest levels of academic excellence. The Morningside Area Alliance is a membership association of the area’s academic and cultural institutions including The Riverside Church and Manhattan School of Music. The Park, named after the famed Sakura Park in Tokyo, is set atop Morningside Heights and is adorned with shady cherry trees, a central bandstand, and stone walls. Located between Claremont Avenue and Riverside Drive, the Park is an oasis situated between some of the world’s leading institutions including International House, Manhattan School of Music, The Riverside Church, and Union Theological Seminary.